Rock Creek and its tributaries have cut deeply into the hard rocks of the Piedmont , creating Rock Creek Park’s rugged terrain—steep bluffs, side slopes, ridgelines, terraces, deep ravines, and narrow floodplains. The variation in topography helps create a wide variety of habitats—microclimates—for different plant communities. The best time to see topography in Rock Creek Park is in the wintertime Steep slopes carved by Rock Creek. Photographer: Ery Largay, courtesy of NatureServewhen the leaves are off the trees and the long shadows accentuate the landscape. You will probably be surprised to see how much more rugged the landscape is than the rest of Washington, D.C. Rock Creek and its tributaries have carved steep slopes into the hard metamorphic rock of the Piedmont . The highest point in Rock Creek Park and in Washington, D.C., at an elevation of 409 feet (125 meters), is Fort Reno, located west of the Rock Creek valley in the Piedmont. Not surprisingly, it was an important lookout point for the defense of the capital city during the civil war. The lowest point in the park, nearly sea level, is where the mouth of Rock Creek meets the Potomac River (near Theodore Roosevelt Island) in the Coastal Plain . Map tip: To find these locations, go to the interactive map of Rock Creek Park and search for "fort reno" or "roosevelt island." To see the lay of the land in a topographic map of the park, go to the interactive map of Rock Creek Park and zoom out until you can see the whole park. In the Layers/Legend panel, change the basemap to NPS Relief. Play with the Transparency slider bar at the top of Layers On/Off. You can also zoom to about 1:36,112 and turn on Contour Lines (in the Layers/Legend panel, under Layers On/Off). Rock Creek’s overall direction of flow is south, toward the Potomac. However, in the northwestern part of Rock Creek Park, it flows east as it skirts the steep hills that block its southward progress. There, the stream cuts a broad, nearly level floodplain. Then, just south of Juniper Street in the northeastern part of the park, Rock Creek turns south and enters the narrow valley it has carved through crevices in the hills. Map tip: In the interactive map of Rock Creek Park, search for "boundary bridge" to see where the floodplain is broad at the border between Chevy Chase, MD and Washington, D.C. Search for "narrowing" to see where Rock Creek enters a much narrower gorge it has carved between the bodies of bedrock on either side of the creek. Topography influences plant communities in many ways. Most importantly, landforms affect sun exposure, temperature, and moisture, creating distinct microclimates. To understand the idea of microclimate in Rock Creek Park, follow an imaginary line down a long hillside, beginning on the summit of a gravelly hilltop, and ending on the modern floodplain along Rock Creek. Many hilltops in Rock Creek Park are "home sweet home" to only the Chestnut Oak / Mountain Laurel Forest or one other hardy natural community . Photographer: Gary FlemingOn the top of the hill, the land is exposed to strong sunlight and weather from many directions. The convex shape of the hilltop leads to rapid runoff, and the higher temperatures and winds result in moisture loss through evaporation and transpiration (evapotranspiration). Consequently, the microclimate is hot and dry. Rainwater provides only temporary relief to plants in this very rapidly-drained and leached soil. The combination of acidic , quartz -rich gravel and intense exposure to weather makes these hilltop forests the most acidic and dry of all natural communities in the park. Ecobit: “Basic” and “Acidic” Places where the gravel terrace is thick enough to impact the rooting zone of trees are invariably populated by the dry Chestnut Oak / Mountain Laurel Forest or the Mixed Oak / Heath Forest. These natural communities are suited to dry and acidic conditions. 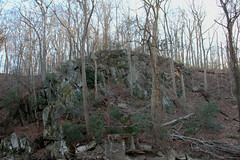 Rock outcrops of Pulpit Rock ( outcrop of Laurel Formation ) at Rock Creek Park (ruins of old mill in foreground). Photographer: Sam Sheline, courtesy of NatureServeMoving off the gravel-capped top of the hill and onto the hillside, you will find finer soils that can hold more moisture. The land may still be convex, but the sun does not strike it directly all day long, and it is exposed to less wind, which means less evaporation and transpiration. 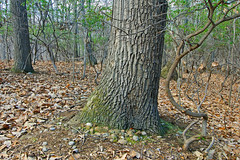 The forest becomes increasingly diverse, with tuliptree and American beech in addition to a diversity of oaks, reflecting a slightly cooler and moister microclimate. The Mesic Mixed Hardwood Forest is the typical community of these gentle to moderate rolling slopes, widespread throughout the park. Continuing on, as you approach the bottom of the hill, the slope may take on a concave (bowl) shape, where soil can accumulate. Silt and clay stripped off higher parts of the hillside by rain, wind, and gravity end up here and in ravines. The soil tends to be deeper and to contain more plant nutrients and more moisture. It may even be fed by groundwater seeps carrying small amounts of dissolved nutrients (minerals). These low, moist areas with thick fertile soil on concave slopes are likely to support the Basic Mesic Hardwood Forest or a lush variant of the Mesic Mixed Hardwood Forest, with a wide array of low plants, including showy wildflowers and ferns. Beyond the toeslope is the flat, low-lying floodplain terrace of Rock Creek. Here the moisture-loving species of the Tuliptree Small-Stream Floodplain Forest thrive on the silty, fertile, alluvial soil. Green ash, American elm, and tuliptree are predominant. Proceeding closer to the stream channel, the landscape drops almost imperceptibly onto the floodway , which is characterized by sandbars and natural levees . The floodway is populated by American sycamore, box-elder, river birch, silver maple, and other moisture-loving species that tolerate both the regular inundation and the frequent disturbance produced by annual floods. These regular, and sometimes dramatic, disturbances can lead to bare openings on freshly-deposited sand and silt that host small, prairie-like enclaves found nowhere else in the park. Map tip: To find examples of these natural communities that you can visit, go to the interactive map of Rock Creek Park and search for "good places." Select one of the Good Places to See Natural Communities in the results box. On concave slopes (rounded like the inside of a bowl), soil, moisture and nutrients tend to accumulate. On convex slopes (rounded like a ball), running water and gravity tend to remove soil and nutrients, creating infertile conditions. In Rock Creek Park, you can see several examples that illustrate the difference between the infertile conditions of convex slopes, and the fertile conditions of concave slopes. 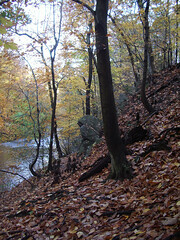 Photographer: Sam Sheline, courtesy of NatureServeOn the Valley Trail just upstream of Pulpit Rock, a large, amphitheatre-like recess high on the slope above Rock Creek is marked by seasonal groundwater seepage and an abundance of New York fern and Indian cucumber in late spring—plants that aren’t found on nearby dry, acidic soil. (Red maple seeds also take advantage of the extra moisture, germinating more profusely there). Map tip: To find this feature, go to the interactive map of Rock Creek Park and search for "groundwater-influenced slope." On the Black Horse Trail slightly south of Milkhouse Ford, a groundwater-fed ravine hosts an example of the Basic Mesic Hardwood Forest, full of nutrient-loving plants. Map tip: To find this feature, go to the interactive map of Rock Creek Park, search for "milkhouse ford" and look just south of that. The tendency of convex slopes to create challenging growing conditions is illustrated on many of the steepest slopes just above Rock Creek and its tributaries. You might expect a moisture-loving community along these slopes, because of the indirect sunlight and proximity to moisture in the creek. However, the steepness and slightly convex shape lead to infertile, shallow-soiled, and drier conditions, which support the Oak – Beech / Heath Forest, whose mountain laurel, hillside blueberry, and chestnut oakare tolerant of well-drained, acidic soil. A nice example can be seen along the Theodore Roosevelt Trail where it hugs the creek. 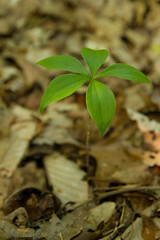 Map tip: To find this location, go to the interactive map of Rock Creek Park and search for "forest on theodore." The Oak – Beech / Heath Forest occupies many of the steepest convex slopes throughout the park. This indicates that slope shape can sometimes have more influence on the plant communities than slope position , slope aspect , or, to some extent, the underlying soils and geology.